John Mueller Meat Co. serves Texas barbecue in Austin. John Mueller is quite famous in Austin for the quality of the barbecue and the several comebacks he has made in selling it (see a nice article here). John Mueller serves his barbecue in an outdoor fenced in lot in East Austin at 2500 E. 6th Street, with an outdoor smoker, covered picnic tables, and a small trailer where the food is served. They open at 1030 am, and when I went on a Saturday in September right before opening time there were only a few people in front of me. The line is not nearly as long as some other places, which was much appreciated to avoid the unrelenting Texas sun and heat. Mueller is there tending the smoker and sometimes passing out cans of ice cold Lone Star beer to customers. Be forewarned: he is a little prickly about people taking pictures of the smoker, which I learned firsthand. The beef rib was enormous and encrusted by a thick bark, under which was a huge amount of tender, smoky meat (see the detail on the right in the picture above). The brisket was excellent – moist, luscious, peppery, complex, delicious. It’s important to get a combination of both fatty and lean sections. Barbecue this flavorful does not need sauce, but they serve a great vinegar-based sauce. I was not as big a fan of the sausage (a little crumbly texturally) or the squash (a little too much cheese), but most importantly the brisket and beef rib make John Mueller Meat Co. definitely worth seeking out. Link to John Mueller Meat Co. website here. 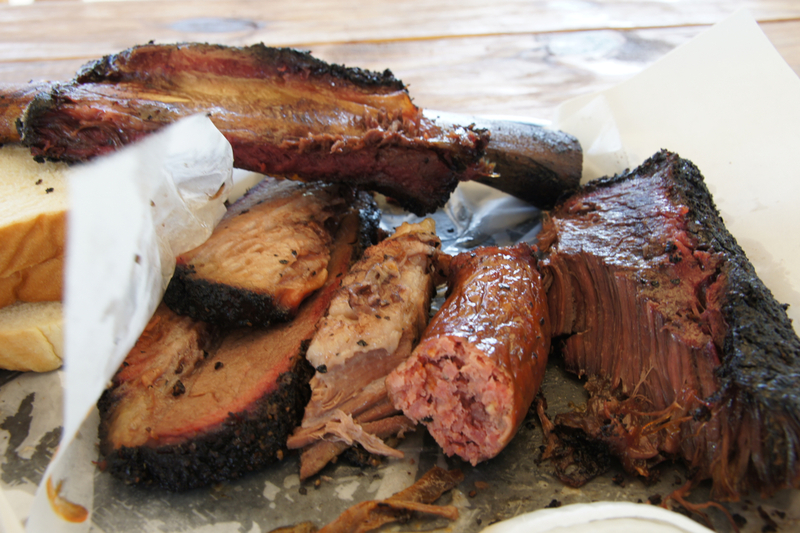 Great pics and descriptions of other Austin barbecue spots here. Chef Paul Qui won Top Chef Season 9, producing really creative, visually appealing food. However, the problem with all of these television food shows is that the viewer can’t taste the food! Thus, my trek to Austin, TX. Chef Qui was previously chef at Uchiko, an acclaimed Japanese restaurant in Austin, and in 2013 opened his own fine dining restaurant, Qui. Before opening Qui, he also founded, along with Moto Utsonomiya, the East Side King food trucks, which has several locations in Austin. After a late night arrival in Austin, I went straight to the ESK at the back of the Liberty Bar, located in a hip part of Austin on E. 6th St. and near Qui. The relaxed beer garden at the Liberty Bar epitomized the really chill atmosphere in Austin. Lots of hipsters, but they were friendly, enjoying good food and beer. The menu has Asian influences with a few twists and is quite satisfying as a late night snack. Thai Chicken Karaage – Deep-fried chicken thigh, sweet-spicy sauce, fresh basil, cilantro, mint, onion, jalapeño. Delicious. Link to recipe here. Poor Qui’s Buns – Roasted pork belly in steamed buns, hoisin sauce, cucumber kimchi, green onion. Delicious, especially with the combination of tender roast pork and a slice of crackling skin. Link to East Side King website here. Coming soon: a visit to Qui as well as a couple of Austin’s (and the world’s?) top barbecue spots. Bar Tartine is the sister restaurant of Tartine Bakery, located on Valencia in the Mission, San Francisco. The restaurant features a modern American menu using locally sourced ingredients and the famous Tartine bread. The fresh-baked bread from Tartine Bakery is really exceptional and a highlight. The bread has a firm, crackling crust, and soft, slightly sour and complex interior. The Smoked Potatoes, roasted and alderwood smoked small potatoes with black garlic vinaigrette and ramp aioli, is one of the best dishes I have had in the Bay Area. The smokiness, crisp texture from roasting, cream from the aioli, and acidity from the vinaigrette are really a winning combination. I used up the rest of the bread to sop up all of the sauce. The rest of the menu is very adventurous and original, mostly focused on fresh, seasonal vegetables. I liked the Farmer’s Cheese dumpling, served in a delicious mushroom broth. The desserts are unique as well, on the border of sweet and savory. Definitely recommended. Link to my post on making Tartine Bread here. Amazon link to Tartine Bread cookbook here. Link to Bar Tartine website here.